Large Incident: A wildfire of 100 acres or more occurring in timber, or a wildfire of 300 acres or more occurring in grass/sage. Canyon Fire (Kern County) 9,820 acres, 100% contained Kern County Incident remains in Unified Command (Cooper, Kinsey, Brinsfield), Power restored to community of Havilah. Incident will transition to back to the local Jurisdiction, remaining in Unified Command Type 3 Incident organization. HQ in Bakersfield on Olive Dr. Granite Fire 203 acres, 80% containment, South Side Hwy 155 x Granite Rd near community of Glennville kern Co. SRA Wildland,Fuels: Oak, Savannah grass, Moderate ROS, Fire burning NNE direction. Border#10 120 acres 50% contained fire entirely in Mexico. Sheep Fire 6990 acres, 10% MMA/Contained, SW of Cedar Grove, Fresno Co, 1.5 miles SW of Cedar Grove. Whitlock Fire 69 acres; 100% contained. 7 Miles north of Mariposa, Dozer line is completed around the fire No further spread is expected. 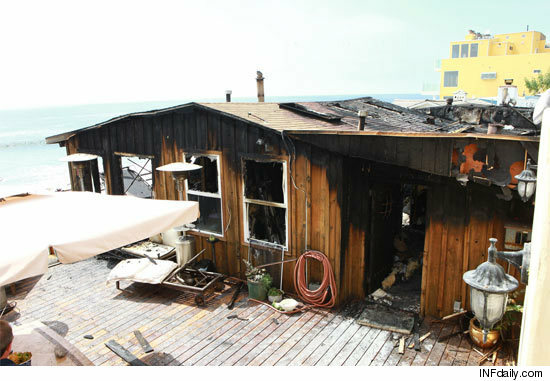 LAFD Malibu: Saturday a structure fire resulted in complete loss of actress/talk show host Ricki lakes beach-side home. The fire was started when she was attempting to fill a portable heater in her home and a couch caught fire. Ricki escaped with her two children and dog unharmed. NOPS: Initial Attack Activity was light in the GACC yesterday with 31 fires for 107 acres reported in the Daily Situation Report. Monday will be warmer and drier under a weak ridge with mostly sunny skies for the afternoon. Another trough will move through Tuesday, generally with just some high cloudiness for most areas, although the very NW corner of Calif could see a bit more rain from that system. Temperatures will remain below seasonal normals for most inland areas even as they will be increasing this week. RH recovery should remain relatively high in most areas under clear skies and longer nights. Areas of night/morning fog/low clouds will return to the coast along with typical daily afternoon gusty westerly winds. Late in the week, it appears possible that stronger high pressure will return to bring about lower RH and put inland temps back above seasonal normals. Black Incident, CA-ENF, is 90 acres, 80 percent contained. Oregon Fire CA-BTU-Oregon 40 acres, 100% (Butte County) Oregon Gulch Rd near Oroville.